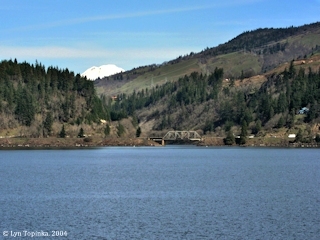 Click image to enlarge White Salmon River with Mount Adams. 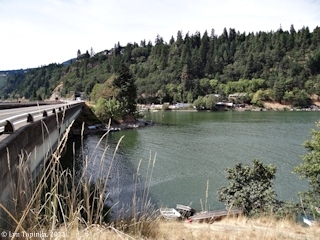 Mouth of the White Salmon River (bridge), Washington, as seen from Hood River, Oregon. Mount Adams is in the background. Image taken March 20, 2004. 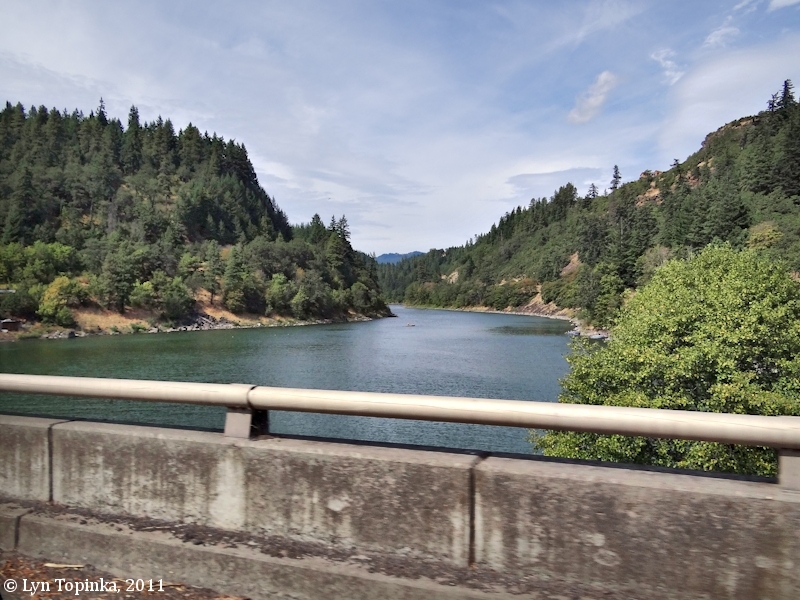 The White Salmon River originates in south central Washington along the south slope of Mount Adams, and then flows south for 45 miles before entering the Columbia River (Bonneville Reservoir) at River Mile (RM) 167.5, at Underwood, Washington. Upstream are the Washington communities of White Salmon (on the hill) and Bingen (at the base of the hill). 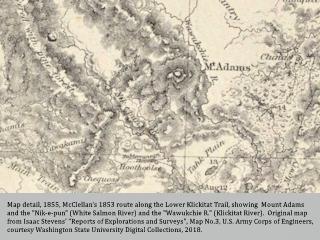 Twelve miles upstream is the Klickitat River and five miles downstream is Drano Lake and the Little White Salmon River, where Lewis and Clark camped on October 29, 1805. Directly across from the White Salmon River is Hood River, Oregon. The White Salmon River was named after the abundance of spawning salmon returning to the creek, whose flesh turned color from red to pinkish white. The Washington community of White Salmon lies on the north side of the Columbia River at Columbia River Mile (RM) 170, on the ridge above the community of Bingen. White Salmon's early history is tied closely with Bingen's. Across the river is the Oregon community of Hood River. 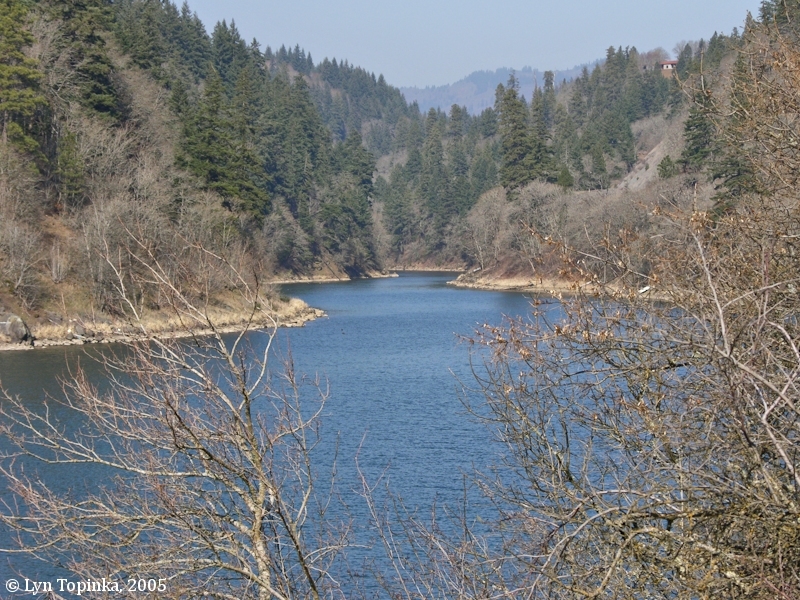 Three miles downstream is the mouth of the White Salmon River, after which the community was named. According to the Columbia Basin Fish and Wildlife Authority website (2004), the White Salmon River drains approximately 386 square miles. Principal tributaries include Trout Lake, Buck, Mill, Dry, Gilmer, and Rattlesnake Creeks. The basin is oriented north to south with elevations ranging from 80 feet to 7,500 feet. Topography varies within the watershed from rugged mountains to rolling hills to river valleys. Consolidated sediments are overlain with basaltic lava flows; subsequent erosion, mud flows, and glaciation have resulted in precipitous cliffs, deeply incised canyons, and relatively flat valley floors. 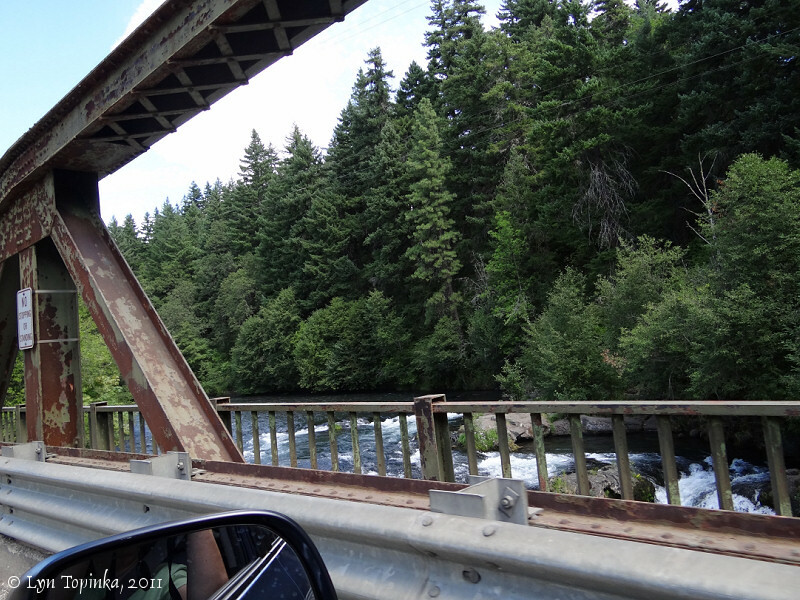 The mainstem of the White Salmon River drops 7,420 feet in the 45 miles for an average gradient of 3.2%. The geology of the White Salmon Watershed is dominated by past volcanic activity. Subbasin soils are the result of volcanism and glaciation. Soils in the valley are deep and coarse with moderate fertility. Lewis and Clark passed by the White Salmon River on October 29, 1805. The "large creek at 1 mile on the Stard. Side in which the Indians catch fish" is today's White Salmon River, which Lewis and Clark named "Canoe Creek". The "large Sand bar from the Lard. Side" is the sand bars from Hood River. In 1841, Charles Wilkes of the U.S. Exploring Expedition, had the the White Salmon River labeled "Cathlatates R." on the inset to his "Map of the Oregon Territory". Upstream of "Cathlatates R." on the Washington side of the Columbia the massive cliffs of the Bingen Gap are labeled "Perpendicular Rocks". 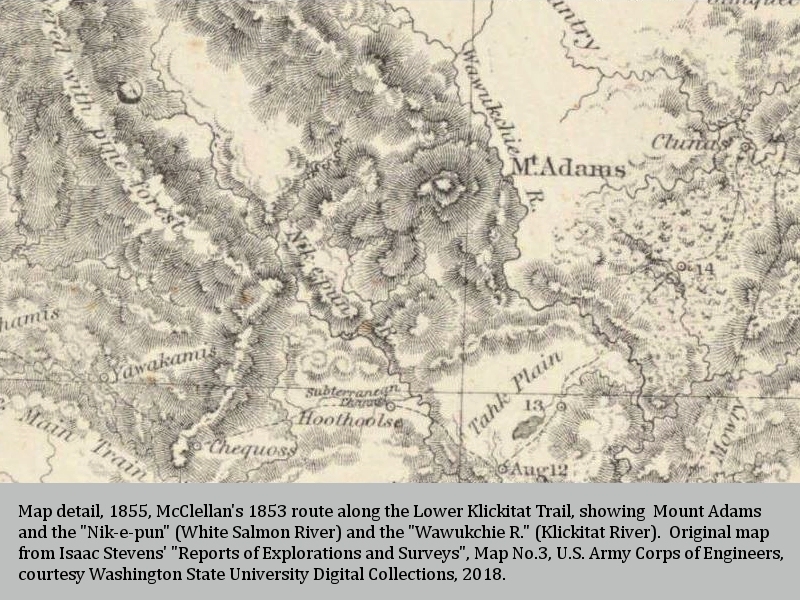 The 1855 Railroad Survey Map conducted by Isaac Stevens shows the upper portion of the White Salmon River labeled "Nik-e-pun", which then merges with the "Klikatat R.". George McClellan crossed the "Nik-e-pun" on August 12, 1853. According to Place Names of Washington (Hitchman, 1985), the original Indian name was "Nikepun". Almost directly across from the mouth of the White Salmon River is Oregon's Hood River. These two rivers run down the axis of the Hood River-White Salmon River Syncline which trends northeast. To the east rises the Bingen Anticline. Mount Adams rises as a backdrop to the White Salmon River. 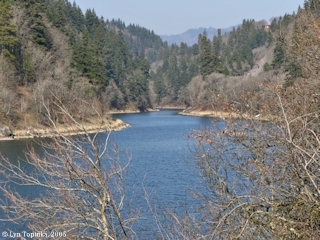 The White Salmon River originates on the southern slopes of Mount Adams. 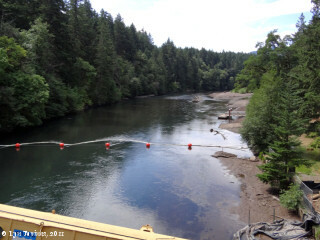 Click image to enlarge White Salmon River, looking upstream from near mouth, Washington. Image taken February 26, 2005. 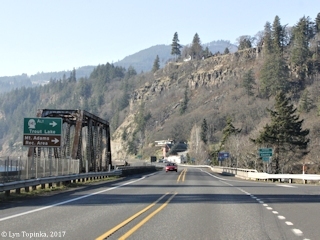 Click image to enlarge Washington State Highway 14 at the White Salmon River, with the BNSF railroad bridge on the left. Image taken December 6, 2017. 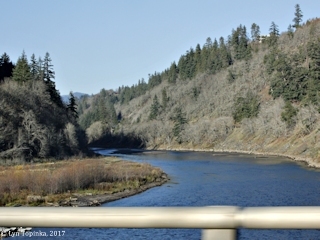 Click image to enlarge White Salmon River looking upstream as seen from Washington State Highway 14. Image taken December 6, 2017. Click image to enlarge White Salmon River from Washington State Highway 14. Image taken August 22, 2011. Click image to enlarge White Salmon River at it's confluence with the Columbia River, Washington. Left bank looking towards right bank. 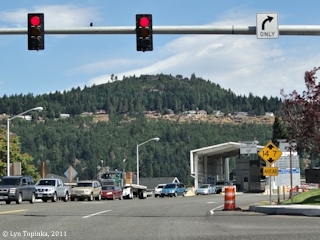 Washington State Highway 14 is on the left. Image taken August 22, 2011. Click image to enlarge White Salmon River near it's confluence with the Columbia River, Washington. Image taken August 22, 2011. Click image to enlarge White Salmon River at it's confluence with the Columbia River, Washington. Left bank looking towards right bank and the White Salmon Treaty Fishing Access Site. Washington State Highway 14 is on the left. Image taken August 22, 2011. The 125-foot high Condit Dam was built in 1913 to create power to support the Crown Willamette Paper Company in Camas, Washington, with an additional power line built across the Columbia River to send extra power to Portland, Oregon. The dam was named for Ben C. Condit, the engineer who was in charge of developing the system, and is located 3.5 miles upstream from the White Salmon's confluence with the Columbia River. The 92-acre Northwestern Lake is the impoundment behind the dam. Fish ladders were part of Condit's original design, but these facilities twice washed out due to floods during the early years. 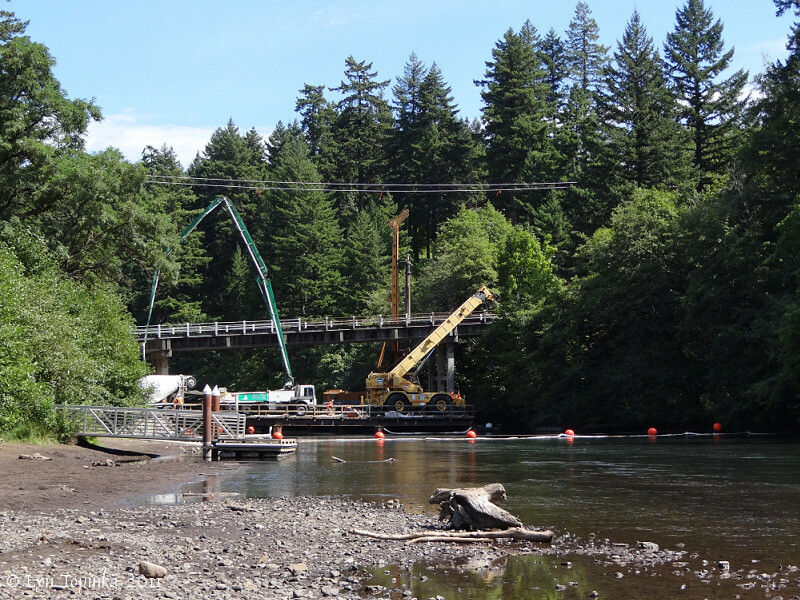 After the second washout, the Washington State Fisheries Department required the power company to contribute to construction of a state fish hatchery rather than rebuild the fish ladders. The dam is slated for demolition during the fall of 2011. 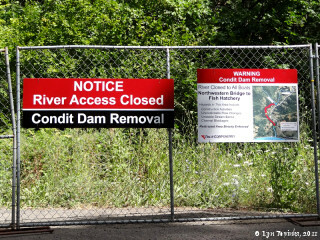 Once gone, wild salmon and steelhead, which currently are trapped at the mouth of the White Salmon River and carted upstream, will once again have access to miles of water and spawning grounds. 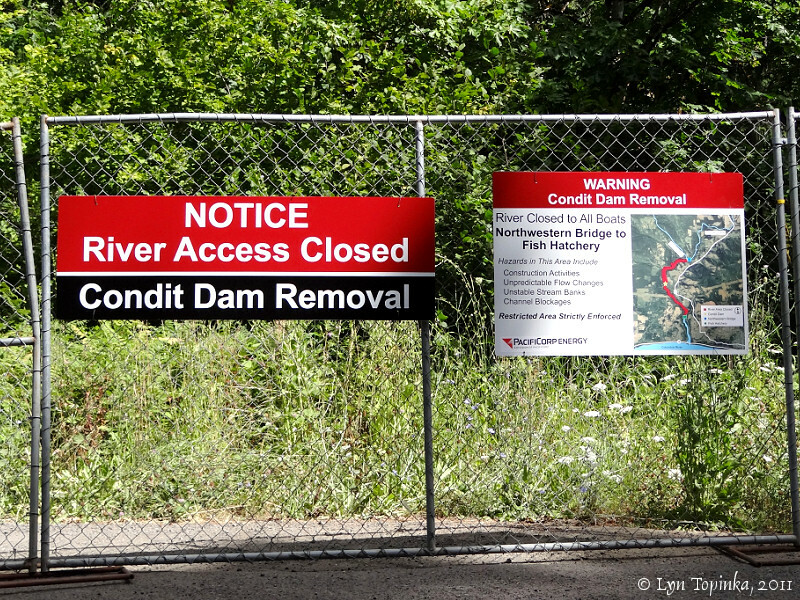 Click image to enlarge Blocked road with signs, Condit Dam removal on the White Salmon River, Washington. Image taken August 22, 2011. Northwestern Lake is/was the reservoir behind the Condit Dam. When full it covered 92 acres. 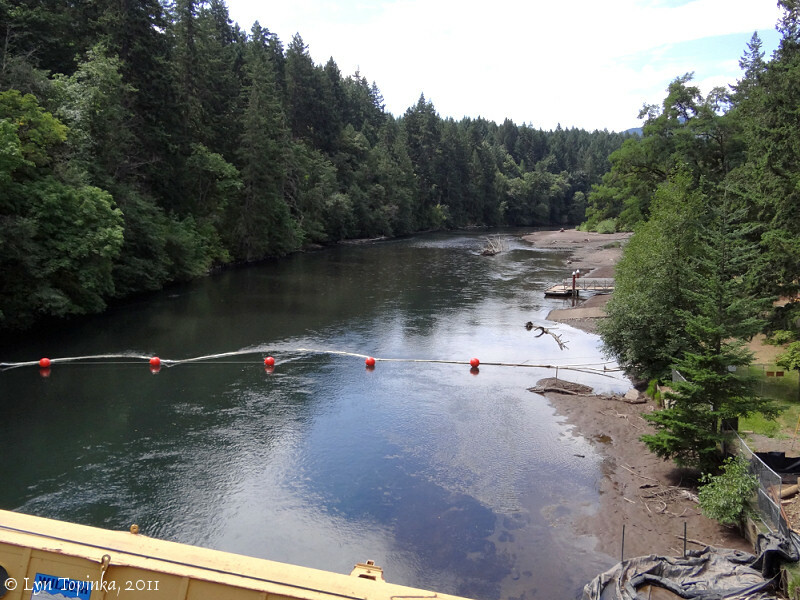 When the Condit Dam is to be removed in October 2011, the area will once again become simply the White Salmon River. As of this webauthor's visit in August 2011, the lake level had alreay begun to be lowered. 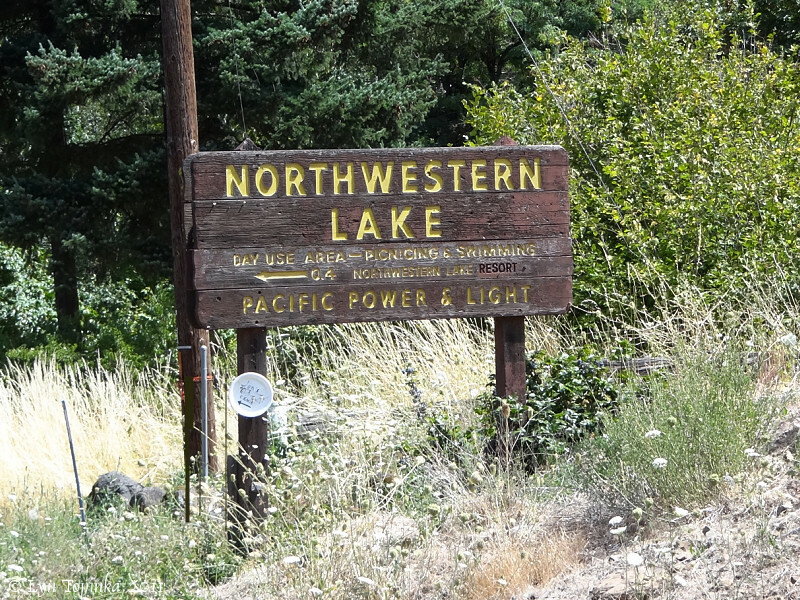 Click image to enlarge Sign, Northwestern Lake, White Salmon River, Washington. Image taken August 22, 2011. 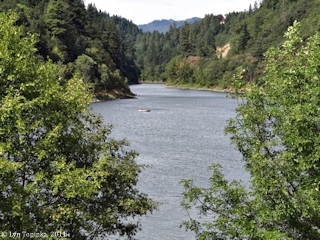 Click image to enlarge Northwestern Lake, looking downstream, White Salmon River, Washington. Lake has already begun being drawn down in preparation for the removal of the Condit Dam. Image taken August 22, 2011. Click image to enlarge Northwestern Lake, looking upstream, White Salmon River, Washington. Lake has already begun being drawn down in preparation for the removal of the Condit Dam. Image taken August 22, 2011. Click image to enlarge Northwestern Lake, looking upstream towards bridge, White Salmon River, Washington. 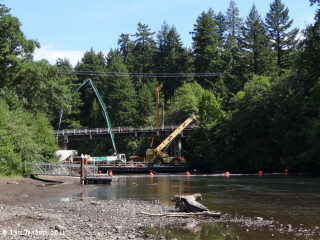 Preparation for the removal of the Condit Dam. Image taken August 22, 2011. In 1986 a portion of the White Salmon River within the Columbia Gorge National Scenic Area became protected as Wild and Scenic. The designated reach stretched from the White River's confluence with Gilmer Creek near the town of BZ Corners, to its confluence with Buck Creek, near the Condit Dam. A second reach was established as Wild and Scenic in 2005, running from the headwaters of the White Salmon to its confluence with the boundary of the Gifford Pinchot National Forest. Total 27.7 miles. Designated Reach (November 1986): From its confluence with Gilmer Creek, near the town of BZ Corner, to its confluence with Buck Creek (U.S. Forest Service website, 2015). Designated Reach (August 2005): White Salmon River from its headwaters to the boundary of the Gifford Pinchot National Forest. Cascade Creek from its headwaters to its confluence with the White Salmon River. This designation is not contiguous with the 1986 designation farther downstream (U.S. Forest Service website, 2015). As of early 2011 on the lower reach, 10 commercial outfitters were issued special use permits to use the White Salmon. 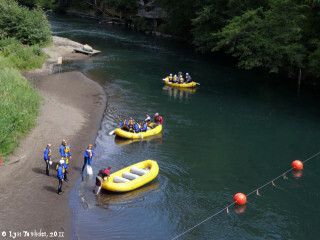 They offer whitewater rafting and kayaking trips. 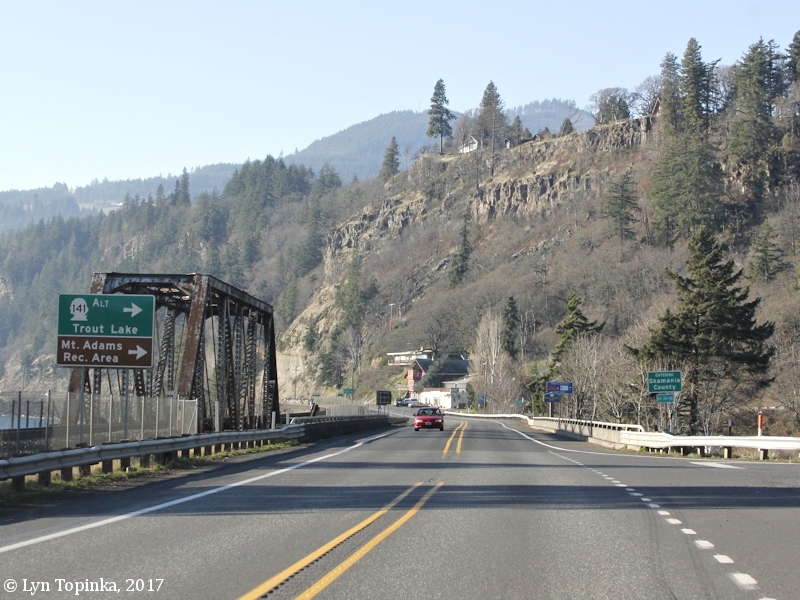 The small Washington community of Husum is located on the west bank of the White Salmon River in Klickitat County, T4N R10E, Section 25, and T4N R11E, Section 30, at a spot where today's Washington Highway 141 crosses the White Salmon River at Husum Falls. The small Washington community of B Z Corner is located on the west bank of the White Salmon River in T4N R10E, Sections 25 and 26, and T4N R11E, Section 11. B Z Corner was named for William "BZ" Biesanz, a "gregarious and witty strawberry grower here in the 1920s." The community of Trout Lake (occasionally seen spelled Troutlake) is an unincorporated city within the Trout Lake Valley, and is located approximately two miles upstream on Trout Lake Creek, a tributary of the White Salmon River. Trout Lake Creek merges with the White Salmon River at White Salmon River Mile (RM) 26. 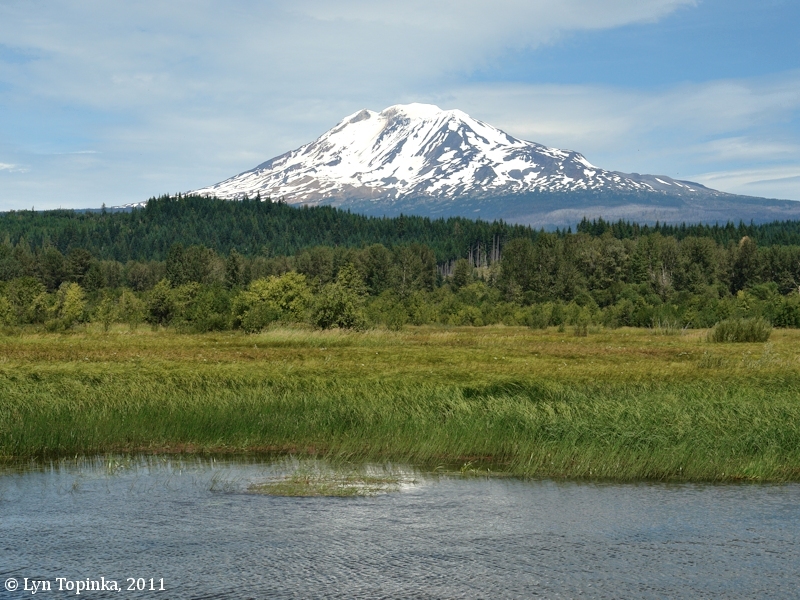 Twenty miles north of Trout Lake lies Mount Adams, noted for wildflowers and huckleberries. West of Trout Lake are located the Guler Ice Caves, which, at the turn of the century were once the source of ice for the entire Columbia Gorge before the development of artificial refrigeration. 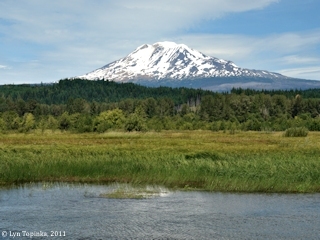 Click image to enlarge Mount Adams as seen from Trout Lake, Trout Lake, Washington. Image taken August 22, 2011.